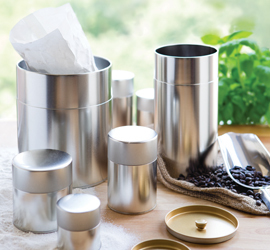 With its simple design and modern taste, the Silver Tea Tin Canister is our most popular item. Ideal for storing pasta, flour, and other kitchen necessities, its simple design fits seamlessly into any kitchen environment. Variety of styles and sizes. The Silver Tea Tin Canister does not feature a clicking cover.